Perfume You Cannot Resist...For Your Hair! One’s hair and one’s clothing can do a great job at showing off their personality. Though they may be born with a specific hair color, they can always add more color or change the shade or tone if they're unhappy with it. Highlights: Highlights are a great way to brighten up a hairstyle. Whether a blonde would like to add some platinum highlights or a brunette would like to add some caramel color highlights, the options are endless. One can even consider options like So.Cap hair extensions in order to brighten their hair color. Lowlights: Low lights are another great way to add color to one’s hair. By going a shade darker or several shades darker than their highlights or natural color, they can create a whole new look without damaging their hair like highlights could do. Color: If a brunette wanted to go blonde or a red hair would like to be a brunette, he or she can do so in a matter of minutes. Changing one's hair color is very easy to do, and can make a world of a difference. One can even dye their hair blue or a tinted purple color; the options are endless, really. Hair extensions: When someone would like to add more color to their style, they can just add some nice clip in hair extensions or adhesive hair extensions. Extensions are becoming more and more popular and are a great way to add color to one’s hairstyle without damaging it. Though some clip in hair extensions or even adhesive hair extensions may be costly, they can offer some great results and last a very long time. Hair extensions are also great for people looking to get fuller hair or even longer hair. Since everyone is born with a different type of hair and color, hair extensions, like So.Cap hair extensions can be a great alternative. By changing the color, style or thickness of one’s hair, they can feel more confident in the way they look and about their overall appearance. Wigs: If someone would like to completely change their hairstyle from time to time, they can consider wearing a wig. Wigs can add so much color to one’s appearance and can change their look in a matter of seconds. Though wigs may seem silly to wear, a lot of them, especially the more expensive ones, can offer some great results and appear to be very natural. Again, this would be a great option for someone with thinning hair or even someone looking to change the color and/or style on a regular basis. Thankfully, hair color is something that can be changed very easily. Whether the sun has lightened it too much or it's turned brassy, there are always ways to change the color and even enhance its overall appearance. With the help of hair extensions or even some lowlights, one can change their appearance for the better. If you love wearing perfumes or body sprays, you are going to love the She hair perfume by SHE by SO.CAP.USA . The Silk Hair Perfume is available in three fragrances Passion, Sensual and Exotic. Each one has a wonderful and unique smell that is going to make your hair smell great. By using the She Hair Perfume, you are also going to love the way that it makes your hair feel. Your hair is going to feel more lustrous and it will be so much softer. You will notice the difference the first time that you use it and touch your hair. You can use the SHE by SO.CAP.USA after washing your hair each time so that you always have hair that looks beautiful and smells beautiful. SHE by SO.CAP.USA has outdone themselves with this product. Women love perfume and they love being able to smell great. They also love it when their hair is soft and manageable which is what you will have after using Silk Hair Perfume on your hair. Just a spritz here and there on your hair is going to make a great difference in your hair. You will love the different scents that are available and you can purchase all three so that you have the set and you can use a different scent everyday to keep people wondering how you get your hair to smell so wonderful. They will also notice the difference in the look of your hair. You will want everyone to feel it so that they can feel how amazingly soft it is. 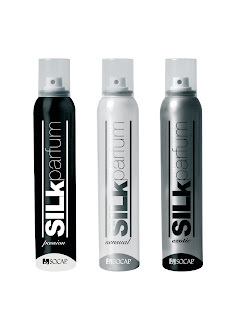 You will be able to use Silk Hair Perfume right along with all of the other hair products that you normally use. You won't have to change the way that you do your hair or the products that you are using. This will be the best product that you and your hair have ever experienced. You will find that this hair perfume is very affordable and you can use it as often as you like and wherever you would like. It is going to change the way you look at perfume and the way that you look at your hair. Treat yourself and your hair to a great experience and love the way it looks and smells after using the hair perfume. 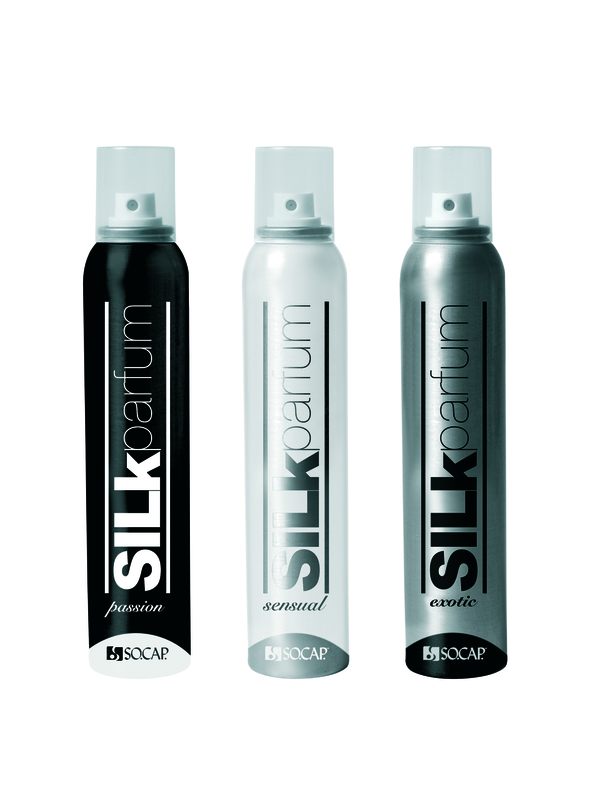 Silk does all that it says it is going to do for your hair. You will find yourself using it every chance you get to keep your hair smelling as beautiful as it looks. If you want long hair but it’s going to be quite some time until your mane grows to the right length, consider getting hair extensions in the mean time. Hair extensions are also a great way to try on a new look to see how you’ll like your hair at a different length. There are several types of hair extensions to choose from. Follow the proper care and maintenance guidelines to ensure your extensions will last as long as possible. Luckily, taking care of hair extensions is a fairly easy process. If you’ve never had hair extensions before, consult a professional stylist. • The cleaner your hair, the longer your SHE by SO.CAP.USA Hair Extensions will last. Hair that isn’t clean will tangle easily. • Shampoo after swimming or working out. • Wash your hair from the roots to the tips. • After shampooing and conditioning, apply a leave-in conditioner. Just make sure not to apply too much. Product buildup will lead to tangling. • Make sure your hair is thoroughly dry before going to bed. Wet hair will tangle and break if you sleep on it. Wrap your hair with a scarf or tie it tightly before heading to bed to prevent tangling. • Brush your hair three times a day and before shampooing. • Use a brush with soft bristles. • Start at the ends of your hair and work toward your scalp, brushing downward. • Avoid using products that contain alcohol on your SHE by SO.CAP.USA Hair Extensions. Alcohol-based products will dry out your hair. • Avoid applying excessive heat styling to synthetic extensions. • Limit heat exposure to lengthen the life of your hair extensions. • Blow dryers, flat irons and curling irons should only be used when necessary. Whenever possible, let your hair dry naturally. • Classic bonded hair extensions are safe for all hair textures and can blend into any hair pattern. The process for applying these bonded hair extensions is long and among the most pricey option. • Clip in hair extensions have the clip portion pre-sewn into the extension. Clip in hair extensions are by far the easiest type of extensions to apply and remove yourself. • Adhesive hair extensions, or tape on bonds, are among the newest kind of extension. With adhesive hair extensions, there’s a thin, flat strip of double-sided polyurethane “tape” that adheres the extension to your hair. • If you’ve never had extensions before, ask a professional stylist to apply your extensions the first time around. Once you have the hang of caring for extensions, you’ll be ready to apply your own in a few months. • Not every salon has stylists who are experienced with extensions. Find a salon that’s been open for a while and ask for a seasoned stylist who’s applied many sets of extensions before. • Only a stylist should treat your hair with color or other chemical processes once you have extensions. Don’t try to color your hair on your own. Why Use 4U Wet Products? Reach for the stars, literally; your hair can look just like the Hollywood movie stars of today with SHE by SO.CAP.USA wet products which will exceed your performance expectations. Readily available to provide the best 100% human hair extension by far and is laboratory tested. A quality trichology product line especially designed for the maintenance, enhancing and correcting of texture and appearance of SHE by SO.CAP.USA’s 100 % human hair extensions, which are guaranteed by the research and development division. Using such quality extensions warrants the usage of the correct treatment and maintenance system. 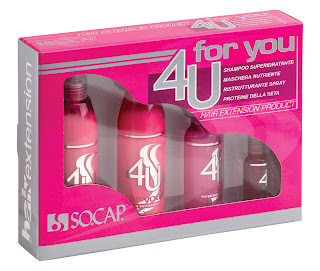 The 4U Wet products by SHE by SO.CAP.USA, has a system for every type of hair. These incredible sets of products include hydro keratin shampoo, reconstructive complex, silk protein and pure shiner which are all sold separately. This is done for convenience, allowing the customer to purchase what they need instead of pre-packaged sets only. The Wet Line is available in a choice of four products in three different color codes, for easy product recognition. They are color coded as: 4U Basic line, 4u Curly line and 4u Straight line. The pink packaging of the 4U basic line is for everyday minimally processed hair and is part of the daily maintenance of your SHE by SO.CAP.USA Hair Extensions. The hair will continue to look shinny and bouncy while feeling silky and smooth. Your extensions will look fresher longer with these light products that won’t weight your hair down. The Purple packaging is the 4U Curly line which is for the curly hair extensions which is assured to help preserve your curl with daily use. Moist and soft natural looking hair with a great health shine is what you will expect and receive with this product. The Light blue packaging is the 4U Straight line, which will preserve the dramatic effect of short or long straight hair. These products are especially light and will enhance the sleek, sharp shinny beautifully maintained look that will turn heads for miles around. Utilizing these products will help retain your extensions original styling and softness much longer than with generic products. The heavier the product the more weighted down, flat and dull your hair will look. Treat your extensions as if it is an investment and like all other investments, if you don’t have proper maintenance, the desired look will be short lived. SHE by SO.CAP.USA's wet products are made for 100% human hair extensions, however these products are great for natural hair as well. Using the right hair brush can make all the difference in how your hair looks, and you could make a serious investment in your hair brush now so that your hair will continue to look great later. Think of it as a personal fashion investment. SHE by SO.CAP.USA hair extensions and SHE by SO.CAP.USA hair brushes work well together. They are both made by the same company, so they are designed to be symbiotic and work together. It is worth purchasing them together and using them at the same time, because that is how you get all the benefit, and you get the true result of looking your absolute best possible now. You should purchase the hair extensions with the brushes because they are designed to work together. They should be used together for the best results. There is no reason not to purchase them together because this company makes the best hair extensions and brushes in the world anyway. SHE by SO.CAP.USA is the company that makes them. There is a vast difference in the SHE by SO.CAP.USA Hair Extensions versus other brands hair extensions. The SHE by SO.CAP.USA Hair Extensions are recognized as the finest in the world. They have a brand new factory that is pumping out lots of hair extensions and bonding equipment too, and they are second to no one. They have only the best, hand-sewn, 100% European human hair substitute, and it has 100% Keratin bonding too, and it will ensure a deep, connective bond. 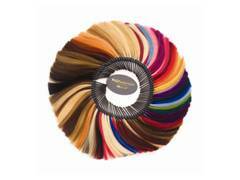 There is also the biggest selection of hair extension types and colors. There are over 90 colors to choose from. They have their own factory in Italy so they specialize in making the most successful hair extensions possible. There are a lot of new clip-in pieces, adhesive extensions, long hair wefts, and other new products as well. They also feature fantasy hair colors and ornament extensions. This is an often overlooked area of hair extensions. People should investigate this more thoroughly though. It can be used for costumes or birthday parties. It can even be used for special events. 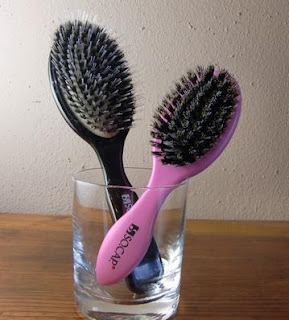 SHE by SO.CAP.USA hair brushes are also amongst the finest in the world. There are seven brushes that come in lavender, gray, and black. They also come in lots of sizes. SHE by SO.CAP.USA recognizes that women are as diverse as the hair brushes that they use and they devise a whole lot of different ones to ensure that women are plentifully supplied with the kinds of brushes that will suit them best. They are also designed with ergonomic factors in mind. There are a lot of brushes that come in traditional sizes. Copyright © 2012 SHE by SO.CAP. All Rights Reserved.